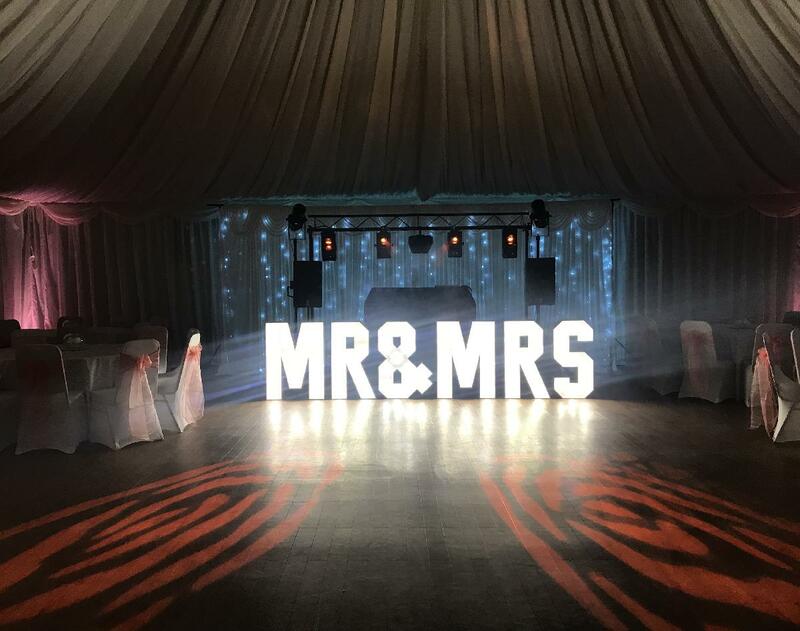 We are one of the most professional and experienced wedding discos in Kent and can also supply extra services such as starlight wedding curtains and confetti cannons. We offer a personal service and always like to meet you both person to discuss and plan your evening which includes timings, music and specific requests. If your chosen venue requires proof of Public Liability Insurance / P.A.T Certificates, these documents will be produced before the day of your wedding reception. If required we are also happy to visit your chosen venue beforehand. Our music collection spans all decades, our DJs encourage and are happy to play requests made throughout the evening. You are welcome to supply a manageable list of favourite songs, artists or genres that you wish to be included during the evening. 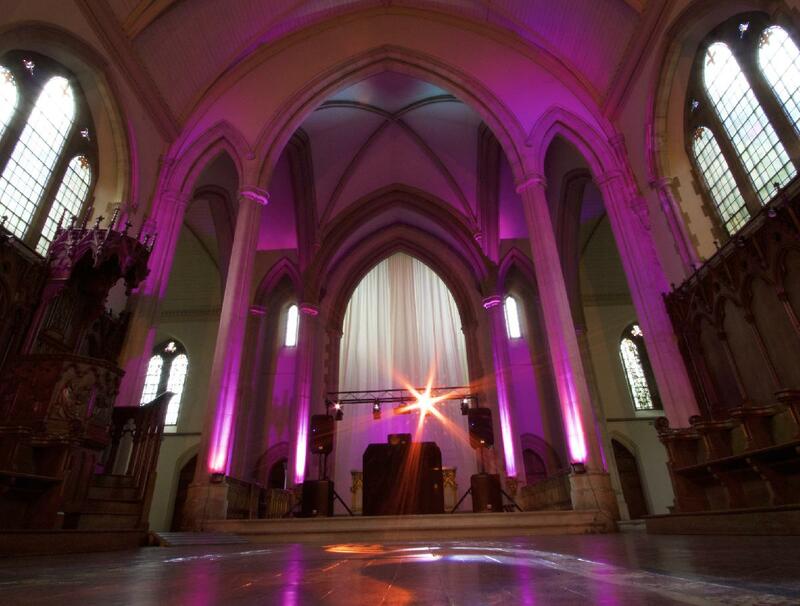 All quotations include lighting, sound system, music and effects i.e. smoke machine / haze (if permitted by the venue), we are always available to assist should you have any queries regarding your wedding reception. All functions booked with us are confirmed in writing. We also supply starlit wedding backdrops / confetti canons - See our section at the bottom of this page. Setting up early prior to the arrival of your wedding party will ensure disruptions are kept to a minimum, but if this is not an option we can set up after your wedding breakfast / speeches when the venue is usually 'turned around' for the evenings entertainment. Setting up equipment prior to your wedding parties arrival. Playing background music during your wedding breakfast. Providing microphones for your speeches. 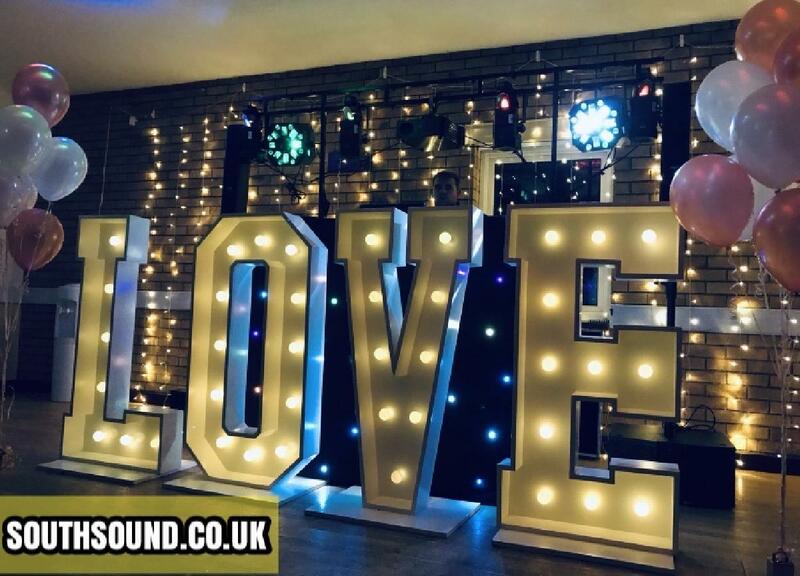 Supplying music throughout your wedding reception until the end of the evening. 2. (Early set up & when your venue provides daytime music). Remaining onsite & providing microphones for your speeches. Supplying music throughout your wedding reception. 3. (For when the venue prepares the room for the evening reception after your wedding breakfast). Setting up equipment in the early evening. Please contact us via our contact form either specifying your requirements or we can reply to you with a list of our most common services with the pricing included. Professional wedding venues usually have a microphone available for use during your after dinner speeches but if they do not then we can help you with this. If you book us to set up early (option 1 / option 2) we will include microphones as part of the package. 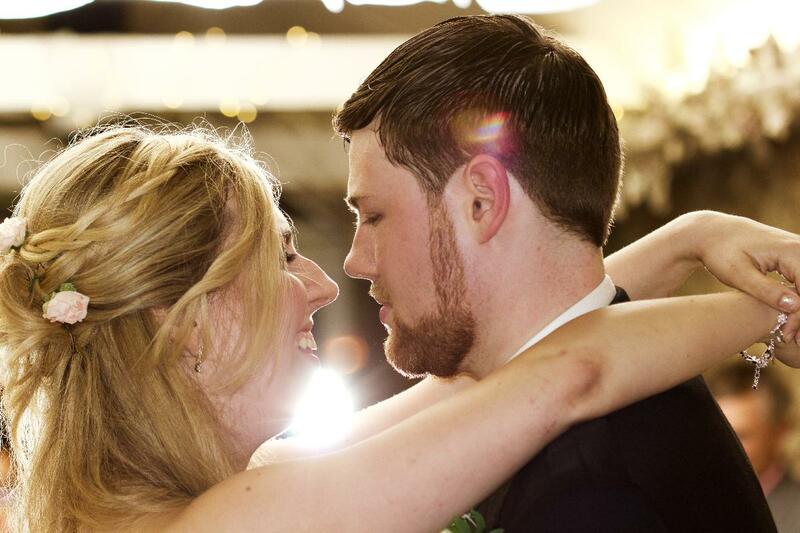 The arrangements regarding your choice of music for your first dance will be discussed prior to your wedding day. 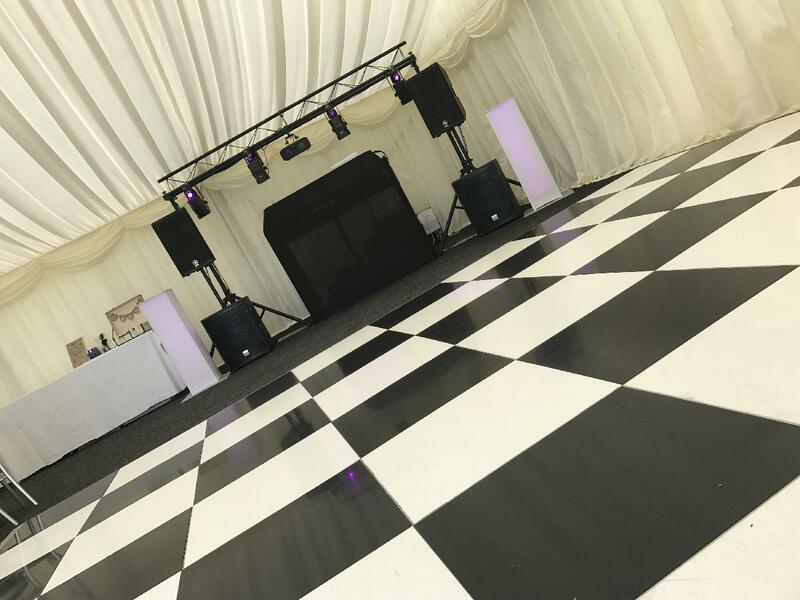 We will also ensure that everyone is given fair warning and gathered around the dancefloor giving them enough time to have their cameras ready to capture your special moment. After your first dance, we will play another chosen song and invite your family and guests to join you. If you wish for a father / daughter dance then we will also introduce the father of the bride to the dance floor. 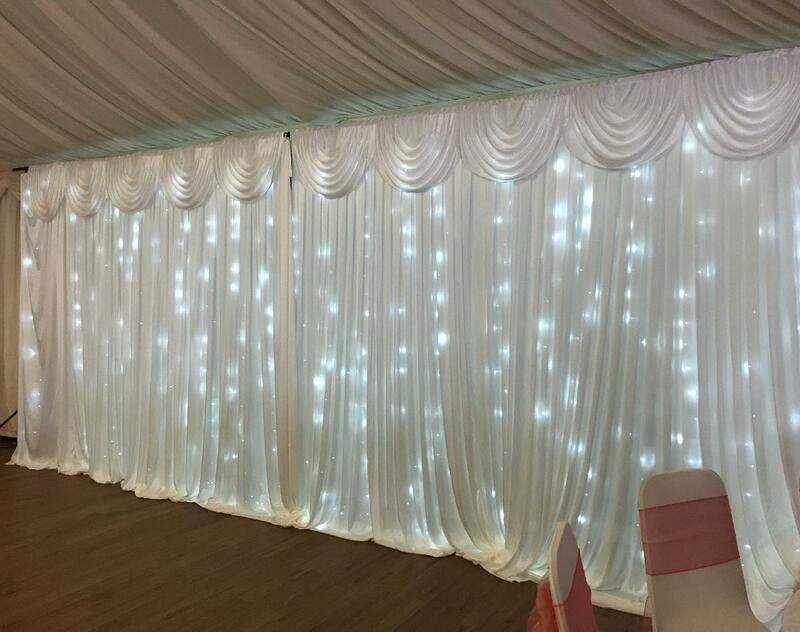 Our white LED backdrop curtain is ideal for your wedding behind your head table, dance floor or behind your entertainment, measuring either 3 meters / 6 meters (w) x 3 meters (h) it hides any unsightly wall decor (wallpaper, light fittings, radiators etc). Hire includes delivery to your venue, installation and dismantle, we also hand steam the curtain to ensure it looks perfect. The LED's can remain static, fade in / out or twinkle at a range of speeds. When used behind a head table we usually require a couple of hours to set the curtain up, this is due to the time involved with the hand steaming process. 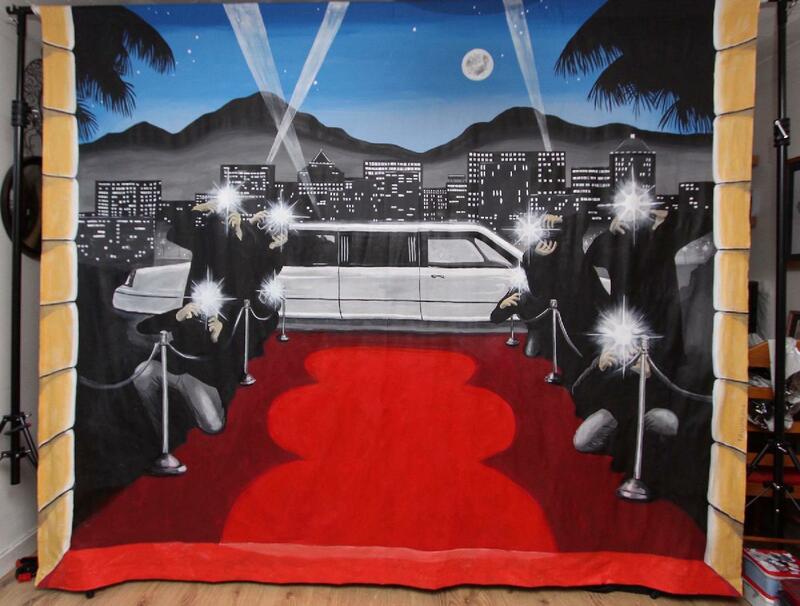 We have our VIP photography backdrop available to hire should you wish to add a little extra glamour and fun. Measuring 3m x 2m it is large enough for group photos and includes props. Our confetti cannons are proving very popular adding that extra wow factor at your wedding for just an extra £50. Multiple colours of confetti are available, and we bring a powerful vacuum to clear up after us when the party has finished. 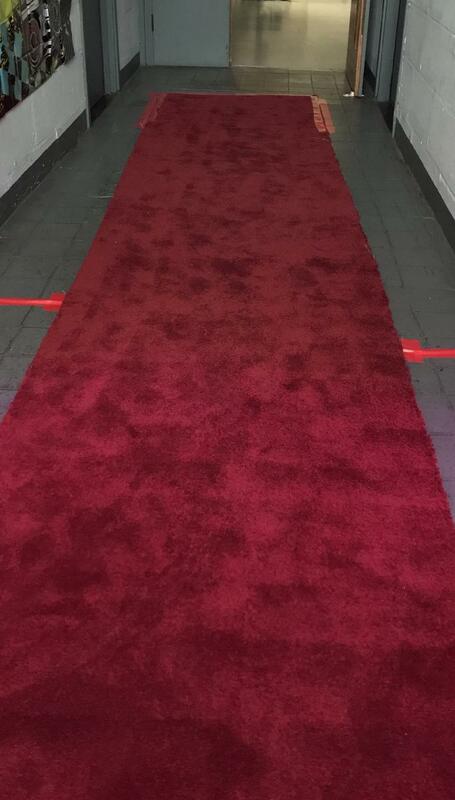 Red Carpet Hire - For that perfect wedding entrance (measures 1 metre x 5 metres). 72 % of brides said they would have spent more time choosing their wedding entertainment. During wedding planning, brides said that their highest priority is their wedding attire, followed by the reception venue and the catering - reception entertainment was among the least of their priorities. Within one week of the reception, 78% said they would have made entertainment amongst the highest priority. Entertainment is commonly just 5% of the wedding budget, but 38% of the guests will remember the entertainment more than anything else. When guests were asked what they remembered most about a wedding after the Bride’s dress and the wedding ceremony, 81% said entertainment.